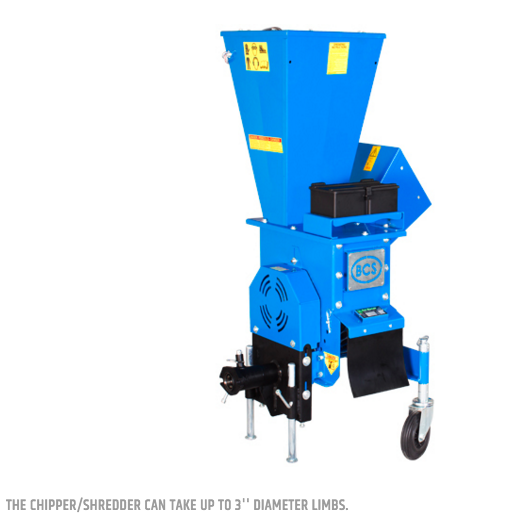 The BCS Chipper/Shredder, also called the B-100, is as heavy-duty as it is useful. 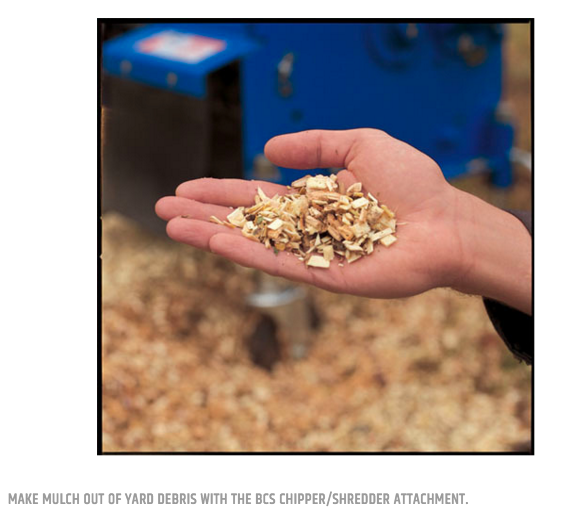 Attaching effortlessly to BCS models 722 and up, the chipper/shredder is easily transportable and accomplishes a variety of useful tasks. A high carbon steel chipping blade mounted to a heavy, ½” thick flywheel is combined with 28 swinging steel flails for multi-purpose action. The rotor is much heavier than competitive chipper/shredder brands, and that extra weight creates more inertial momentum which translates into superior performance. 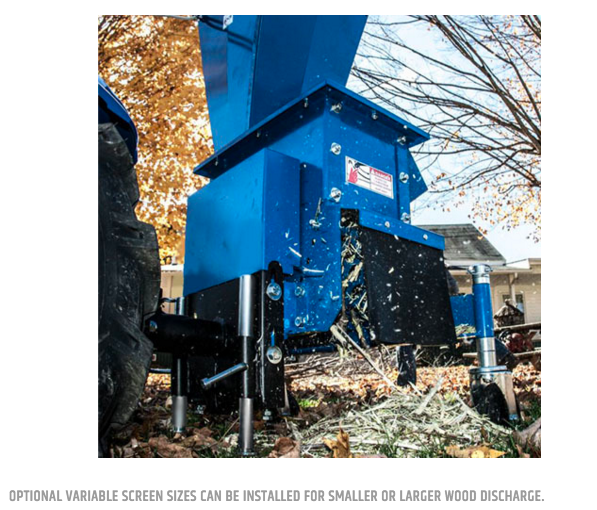 The Chipper can easily take limbs up to 3” in diameter, and the discharge chute is equipped with a rod and lynch pin for quick removal of the discharge screen. Two adjustable caster wheels allow for easy transportation, and a pair of adjustable legs can be implemented for increased stability during operation. 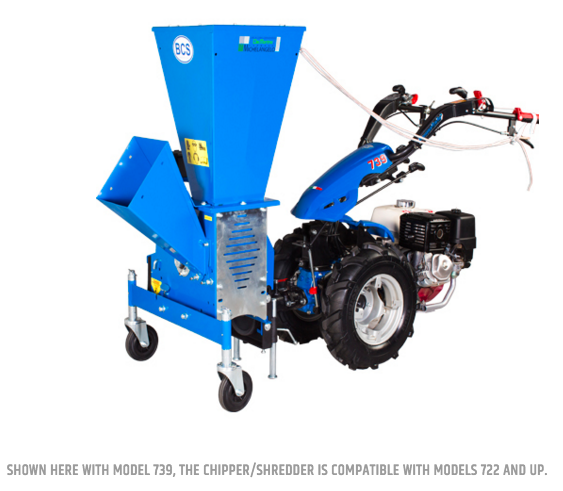 The Chipper/Shredder is also available as a “stand-alone” unit called the EC100, which features a Subaru EX27 engine and wheelbarrow-style handlebars for transportation. Ask your dealer for availability. Create mulch for around gardens, flower beds, etc. Shred garden debris for compost. Shred newspaper for horse bedding. 28 reversible hardened steel flails for shredding. 37-lb flywheel provides extra momentum to power tough limbs through blade. Single removable blade mounted to flywheel for chipping. Chips limbs up to 3” in diameter. Adjustable legs for more support in operation. 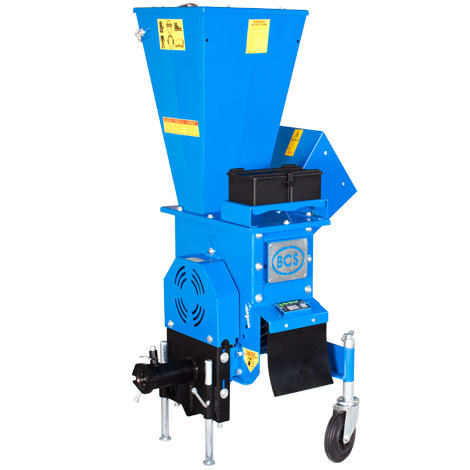 Includes 1 3/8″ screen and rods-and-rollers for shredding heavy, wet material without clogging. 3 ¾” x 4 ¾” size opening at blade; 9 ¾” x 9 ¾” at opening of chipping chute. 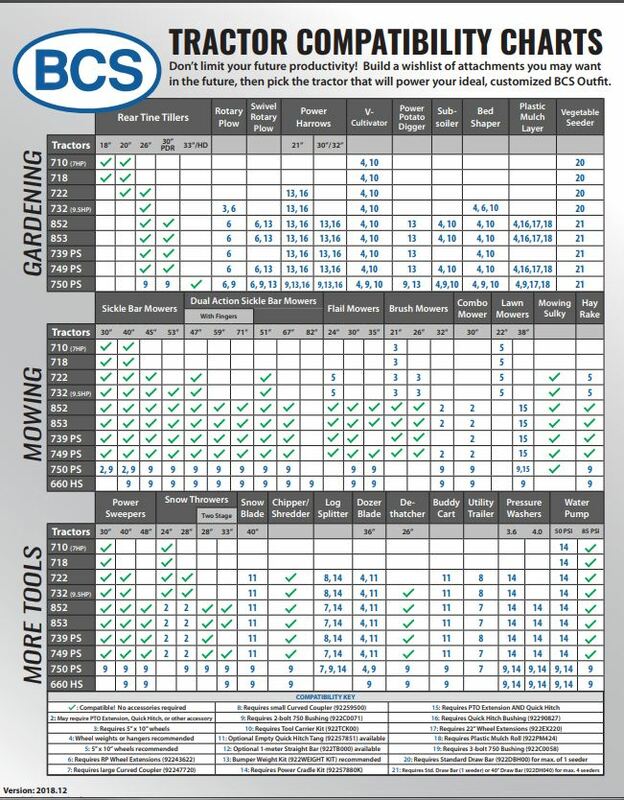 Additional screen sizes available, including discharge holes of 15mm, 20mm, 25mm, 30mm, and 50mm.